I'dlike to share with you my research now I have some hindsight on the model. This portfolio is running for 5 full months now, and have paid its Q1 perf fees. 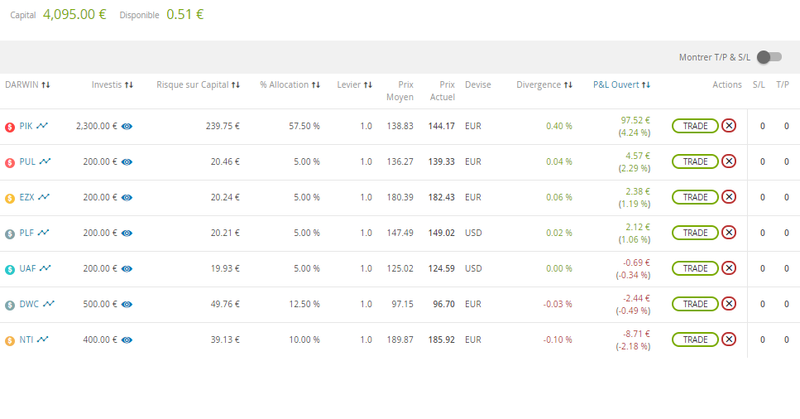 The "spirit" behind this portfolio is a mix of maths, and simply... common sense (assomptions, deductions, observations), but operating under a predefined systematic model for trade execution. to prove that correlation is more powerful to fix / stabilize a model than individual performance, or % allocation, if we assume that all assets have an equal statistical risk (wich is a topic that could be discussed later on). 2) Focusing on the quality of diversification on non-correlated assets, watching the portfolio as global, and not each DARWIN as an individual, makes you able to stick to your model, and the diversification compensates for the risk. For this reason, I've added randomness in its composition, you'll see on the chapter below. to establish a simple and scalable process, that anyone can apply very easily in 5 steps, answering 5 questions. To be honest, this kind of results was totally unexpected at the start of the experiment. 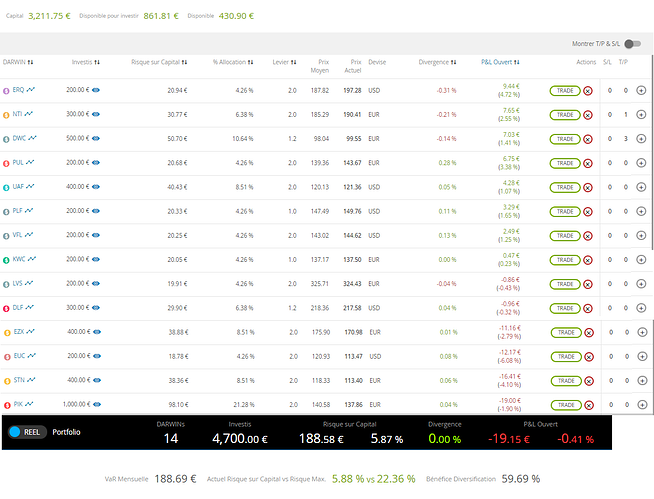 The robustness, the volatility vs return, the overall behavior, are far above all my initial forecasts. For this reason, I'm taking some risk for the future posting this... why? because for the time being, it is robust and profitable! So... enjoy, it is free lunch guys! 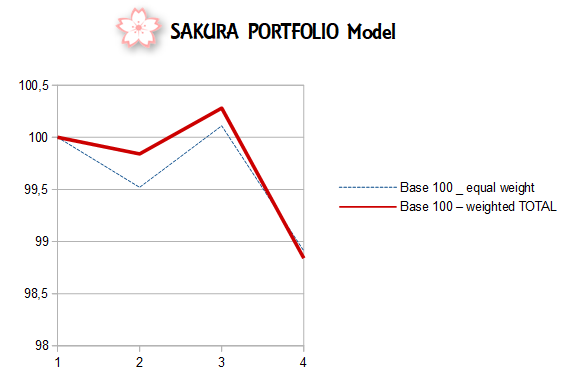 -50% based on discretionary choices with only one criteria: they have to be non-correlated with the above, and accross them. 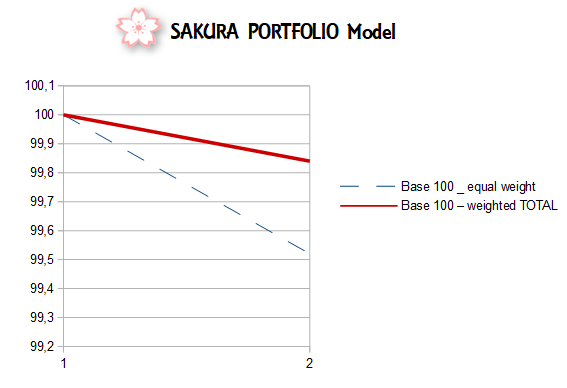 Just like @DarwinexLabs -> http://blog.darwinex.com/darwin-filters-alternative-markowitz-portfolio-theory/ , I think that a more or less equal allocation on quality DARWINs will produce a more robust /stable result than a strict MPT model, in the Darwinex environment. - how could you do some stats and stabilize your overall performance if you jump from one DARWIN to another every day/week/month? 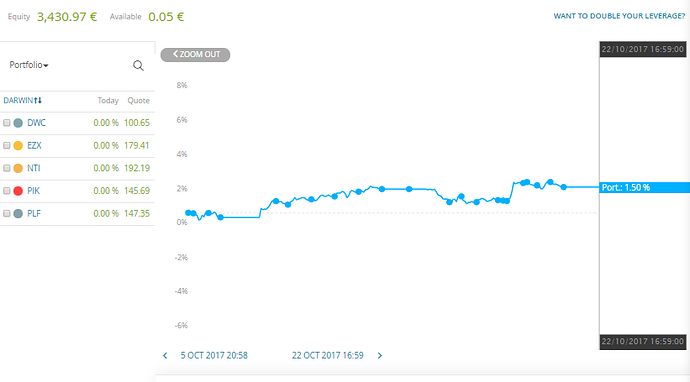 If a DARWIN loses 7% or more in one month or less, I bought 1 unit more (if my initial investment is 200, 200 is a unit) to play the recovery (that's why we are 50% cash and 50% DARWINs at the start). 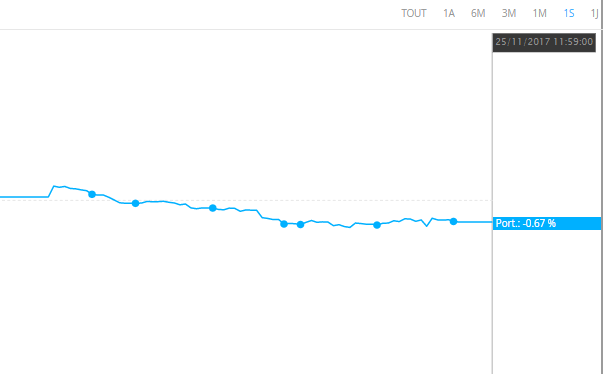 The speed of the loss is more important than the size here, we are searching for a "statistical accident". A DARWIN that loses 1.5% per month, 5 successive months for example, does not meet the criteria. 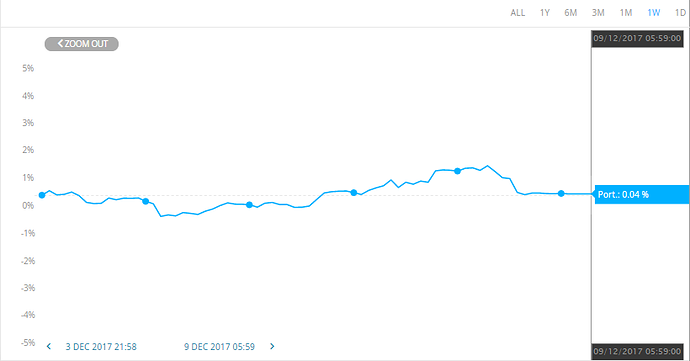 - One month after, regardless of any other aspect (winning or losing) because I don't want to be over invested too much time on a DARWIN that is in a losing streak on a bigger scale (long term cycle). To switch from DEMO to LIVE environment, I've added a rule of entry. 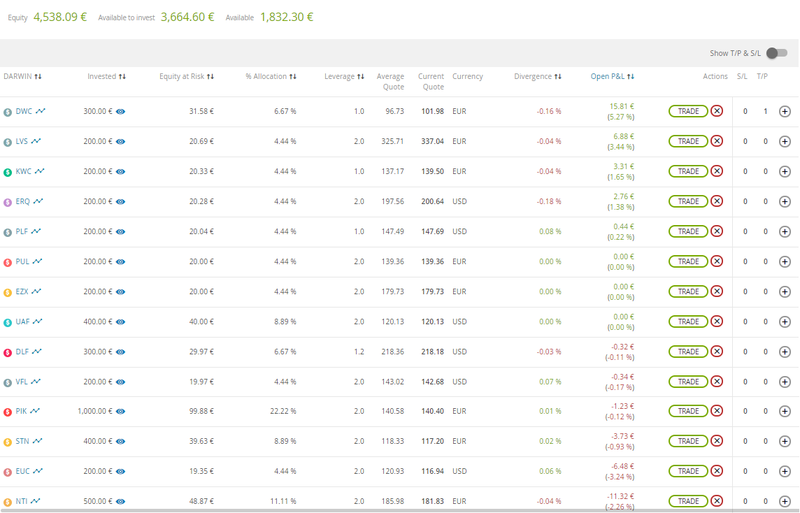 So I won't jump in and buy all selected DARWINs, but will apply my arbitrage rule to enter my initial investment on each individual DARWINs, until my portfolio is complete. Additionnally, because JMC is full now, I had to replace it. DNA was disappointing, but maybe I will keep it anyway to stick to the initial model in demo (thinking about it...). Since this portfolio surprised me very positively in term of results, all the goals discussed earlier have been reached. 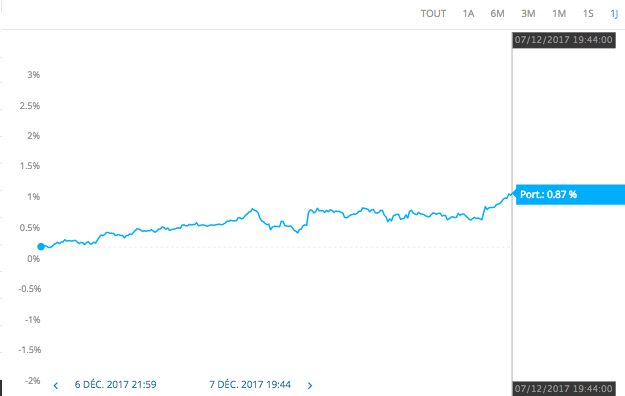 As a natural process, the goal is now upgraded Let's run it in REAL and see the (hopefully profitable) results in 6 months guys! just remember that the trading equity of PIK is invested in the DARWIN.... so actually I'm greatly overweighted on it. I will find a solution to smooth the allocation by either, cash out 1 unit (200) from PIK when I have to invest in a DARWIN, or increase the size of 1 unit. Anyway, I'll keep you posted! I am asking because it is close to be a canditate for my live portfolio. Being an investor you confirm that you are also a Trusted Trader. Is BUE your main system? BUE is not my main system anymore. I'll tell you BUE story my friend! But after Reloaded and the new algos on track, BUE (which was poorly rated before) suddendly got a 60 D-Score, while in the meantime, PIK was just a baby (19 or so D-Score). So I've decided to take advantage of this D-Score to grab some DarwinIA prizes if possible. I took one prize, and another 2 months later. That is the reason why BUE is still active. 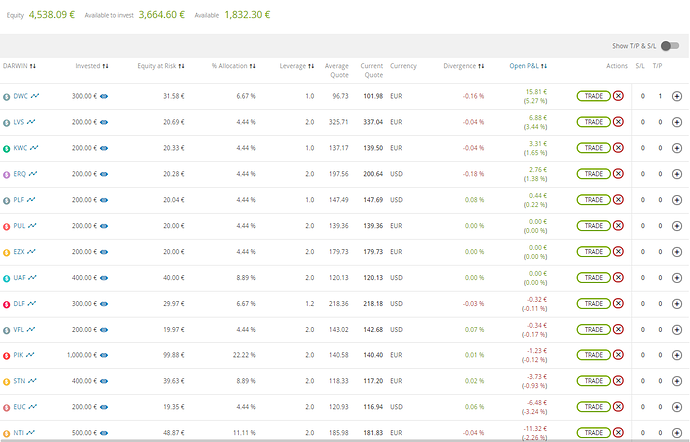 I've called it the DarwinIA racehorse because in a nutshell, it trades the same assets than PIK, but has a clear and pronounced directional biais, and take some bets that I don't dare to take with PIK. So it is much much more volatile in average (not these times since I don't have enough visibility to add up some size). Maybe 2 times more volatile than PIK. 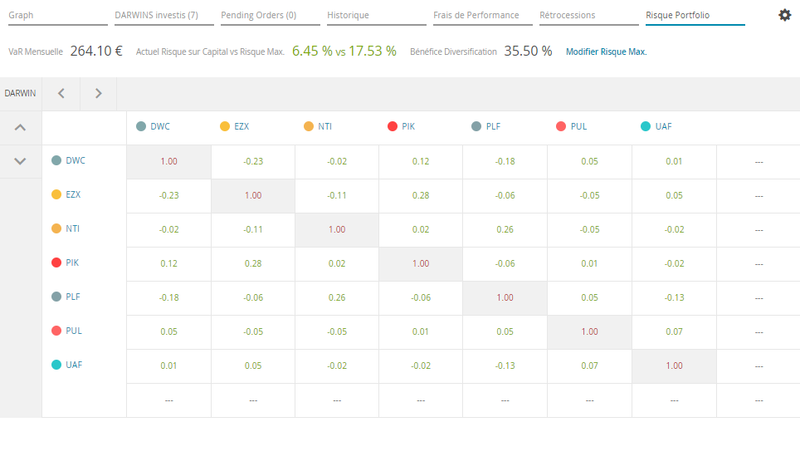 So to answer your question, BUE can produce interesting results and nice surprises because of its volatility, but it is not very consistent / predictible on a 3 month timeframe for example, since it is very dependent of the market evolution and conditions. It is an oldschool buy & hold approach without any (or a bit) intraday price optimization. If at some point, PIK reaches 60 D-Score, and at the same time there's no open investment on BUE, it will probably disappear (except if I have a new idea in the interim). I don't think about reducing greatly my exposure in $PIK, since it is my finished product, after 2 years of development as per Darwinex algorithms. And... since I have only 4 loyal investors (including me) I want to keep my trading equity as a "10% VaR investor" on it. 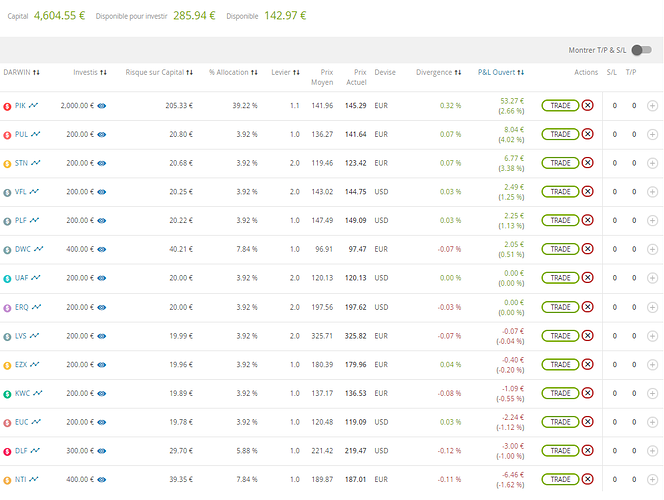 Having said that, a BIG thanks for these investors! Not so much in term of numbers, but loyalty builds confidence, especially in stagnation / darwdowns. 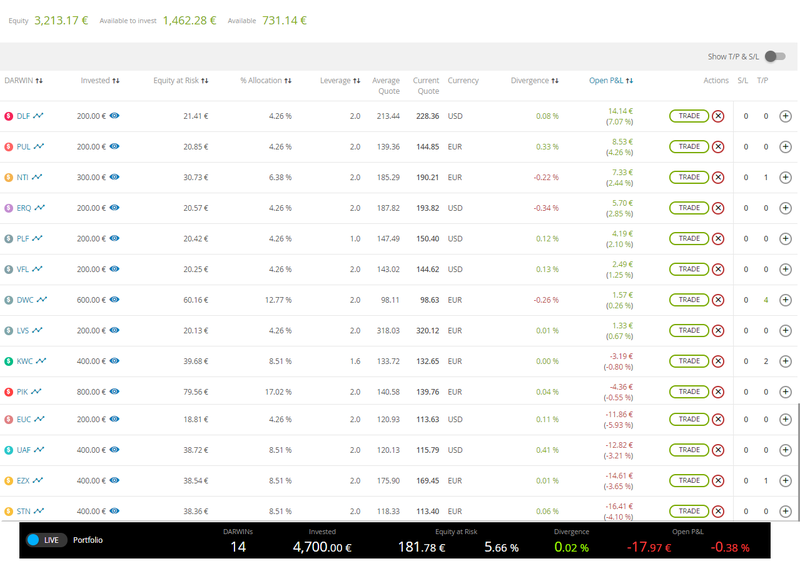 And on a separate note, these kind of investors are those who prove that investment is not only about picking the best asset at any given point in time (because numbers prove that the best trader on 1 year might possibly be the worst trader on 1 particular month), but is mainly about patience and consistency, just like trading! PS: I will create a post for $PIK, this way I won't mix investment and trading, but fyi, to have some cash at diposal, I'm actually reducing my VaR (so increase a bit the intraday volatility) to compensate the fact that I will withdraw 10% of my investment on it to allocate to other DARWINs). 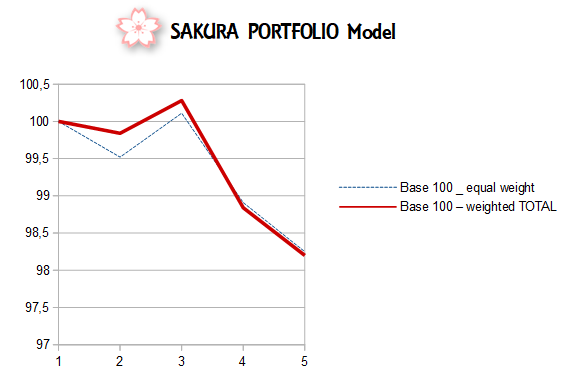 1- NET returns on the initial model, ie $PIK is not overweighted (Base 100 _equal weight). I'll take into account the same level of diversification rebates to do so. Both will be indexed on a 100 base, just like a DARWIN. 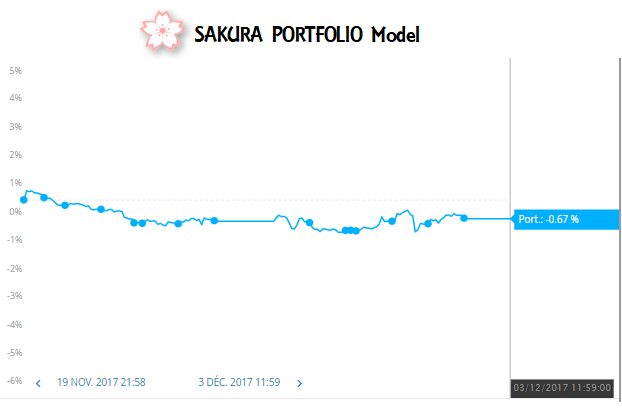 Please note that the portfolio can experience unexpected volatility, since it is not yet stabilized and the allocation not completed. I've pushed a bit my entries in term of timing, to stabilize as quickly as possible the overall. And, now we have our full size, we will be able to use the platform graph instead of Excel to track Theoretical Return %. We will just assume that the portfolio start date is 1st of November, with some randomness on the first 2 weeks. 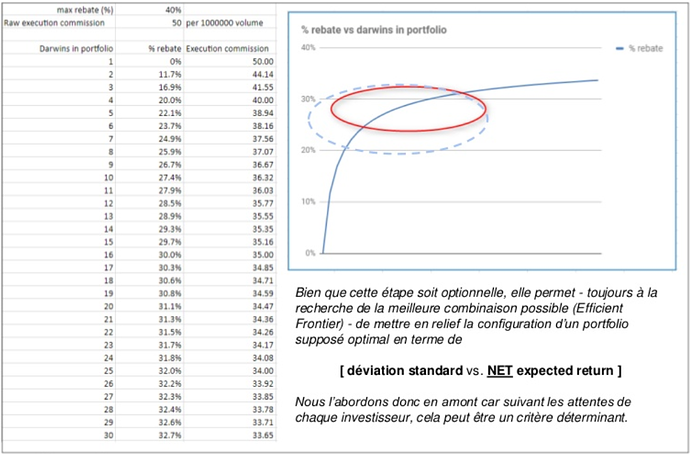 I will keep tracking Net Return % (+ rebates - perf. fees +- divergences) on a separate chart, on a weekly basis. 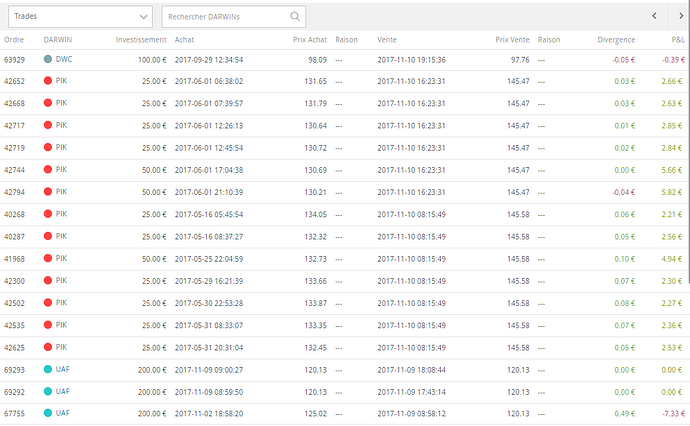 on $PIK selling some trades I bought earlier in the year @133. more or less. on $UAF because it reaches its monthly loss limit so no need to block margin on it until 1st December. good luck on your handover! 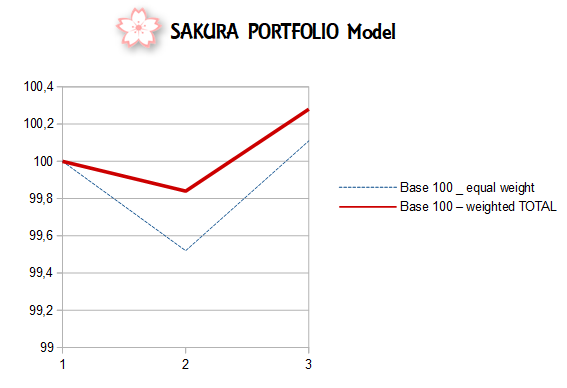 If the model keep on doing well, the goal is to use a TWAP to increase the investment smoothly. Maybe for ex: add (1/4 unit) on each DARWIN, each end of month. 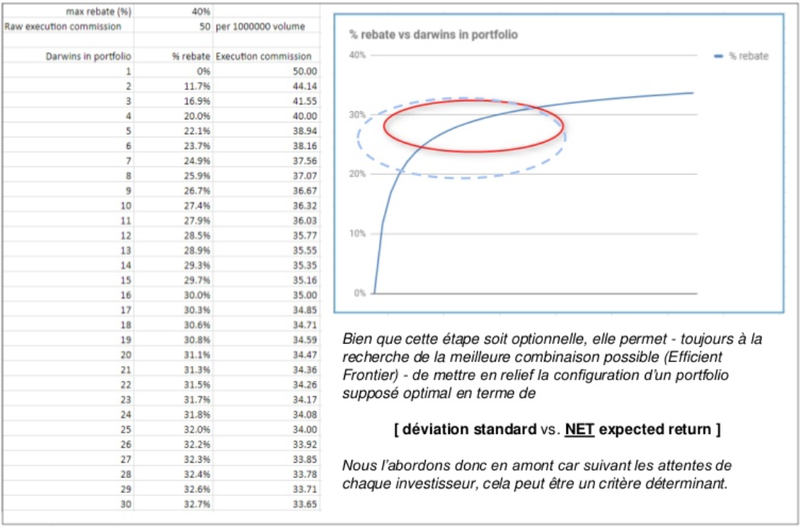 it will be interesting and "compare" % return in future months with #FOTportfolio (LOL). Hi @KonekoChanFX!! Thanks for all this feedback. May I ask a question, since you had two rules to select DARWINs and you have inserted DWC (a cyclic Darwin). I wonder which of those two entry rules have "selected" this DARWIN. I will follow your results with great expectation! Congrat, you have spotted the intruder! 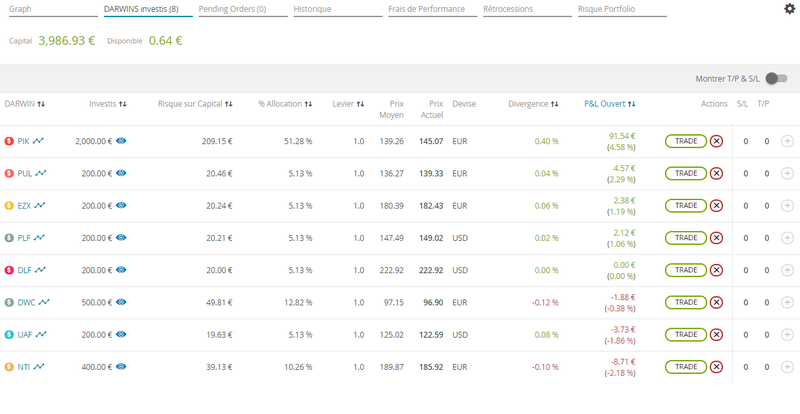 $DWC was not part of this portfolio initially. But at some point, I've realized that a certain % of my allocation, even if diversified, was made on DARWINs with a methodology = Low (La) vs. high rate of winners. Sell 1/5 unit when recovers to @98. Sell 1 unit when reaches @108. Keep 1 unit running at any point in time, waiting for it to come back to @97. and @95. As explained before, I'm reducing my exposure as an investor on $PIK as I decrease my VaR on the underlying strategy (increase volatility on the DARWIN) to compensate. - its VaR was reduced by nearly 40% (so the volatility was hard to contain) and took a loss of -3.5%. The good news is: the portfolio is now setup, and stabilized! The story is starting here! 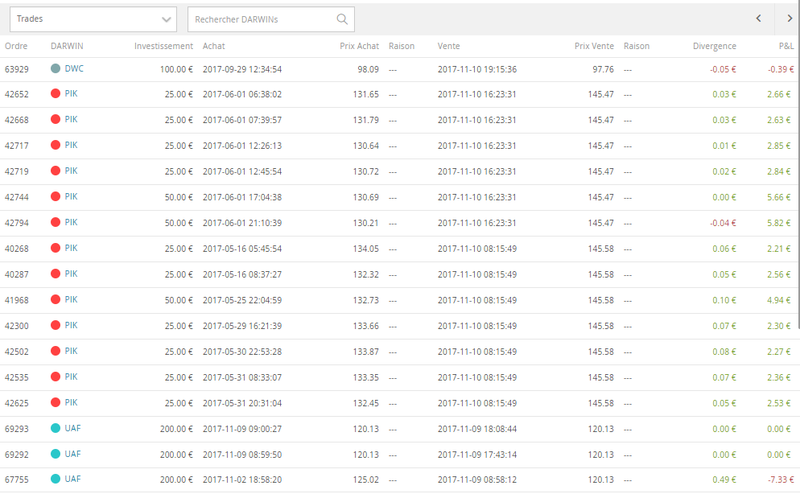 $PIK's VaR is sliding well (with the cons you know) and will soon trade with a balance of 5000 instead of 100, and will be traded as a real trading account, instead of successive vanilla options. (I will make a thread soon to explain $PIK in details). Once full size will be reached in the underlying strategy's equity, investment on it will be re-aligned in the Portfolio, with only 2 units (400). 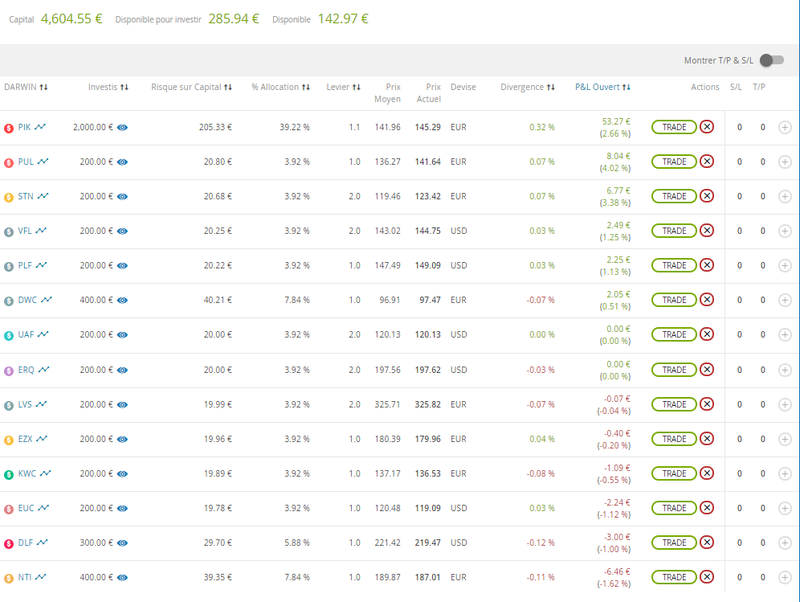 It is not really a delibarate choice, but mainly because I have to pick cash somewhere hehe if I want to increase the size of the account (=underlying strategy). All in all, decreasing the VaR on the account will increase the leverage on the DARWIN. So it should be more or less the same, in term of absolute (€). Since the Portfolio is now stabilized. 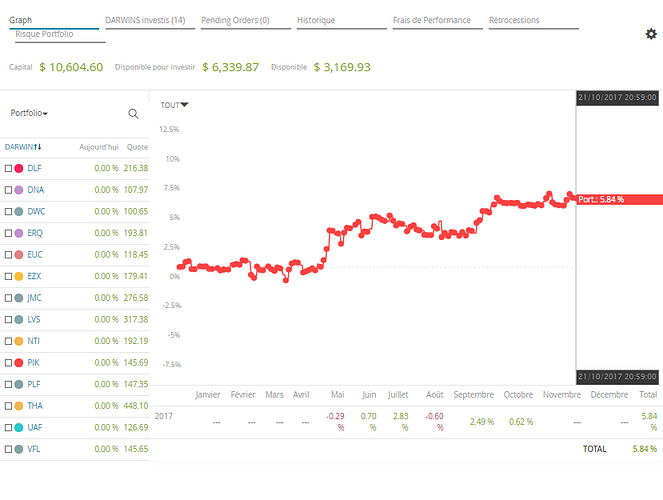 We will use ONLY Darwinex charts to track the performance in the future, with November 20th as a start date. Wish you a great weekend, and... see ya soon!!! No comment to add this week, that's all folks! Nice Sunday to you all! 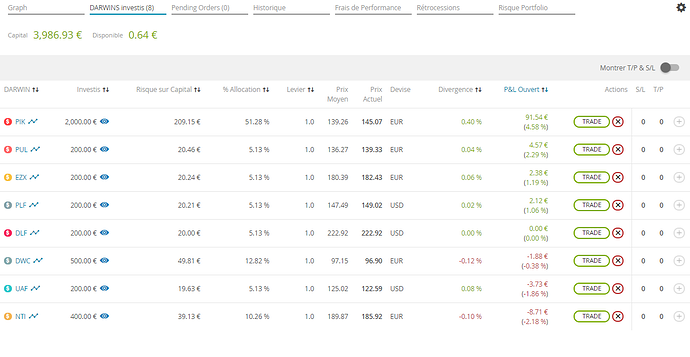 Bravo @TradeHelper Incredible performance today! A lot of arbitrages and Take Profits! Super trend on Tuesday, Wednesday and Thursday.